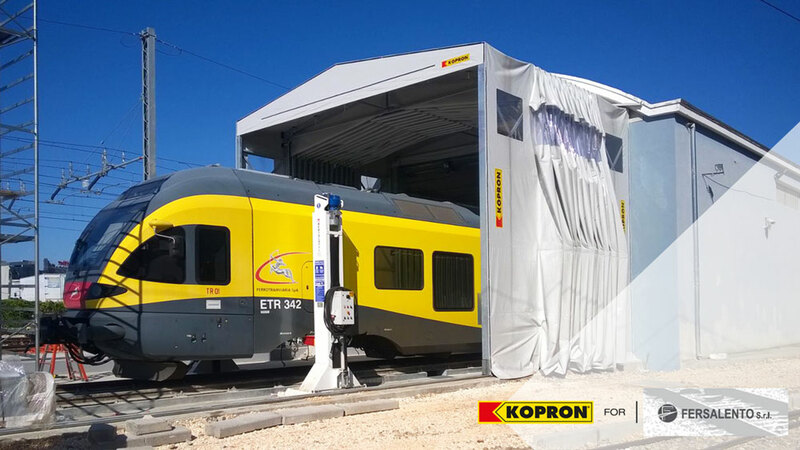 Fersalento is a company of construction and maintenance operating in the railway sector who found Kopron solutions ideal to create a flexible area to enlarge the historical factory. 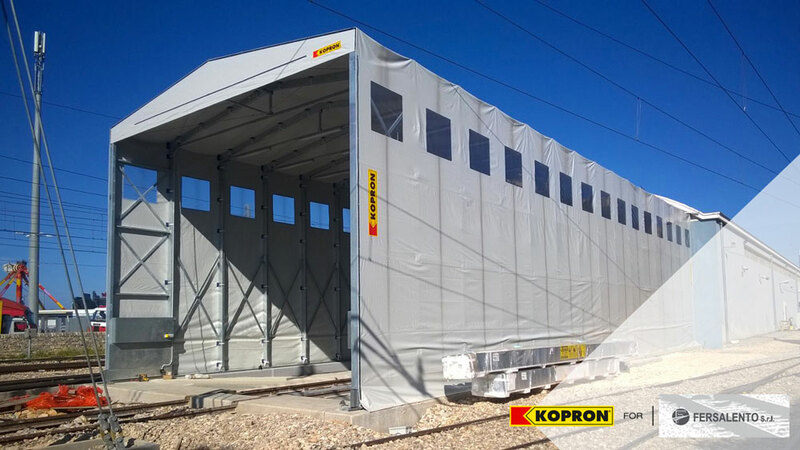 Italy, Puglia, November 2016 – Kopron have always offered customized logistics solutions which perfectly fit in the environment in which they operate, exactly what happened with the retractable temporary warehouse installed at Bitonto, near Bari. This warehouse had two targets: one – enlarge the historical factory of Ferrotranviaria SpA, which had become too small to host new wagons; two – enable maintenance of the trains under a tent, and protect the overhead lines. With a retractable temporary warehouse, the area dedicated to maintenance of electric cables can easily be cleared with no interference for workers. 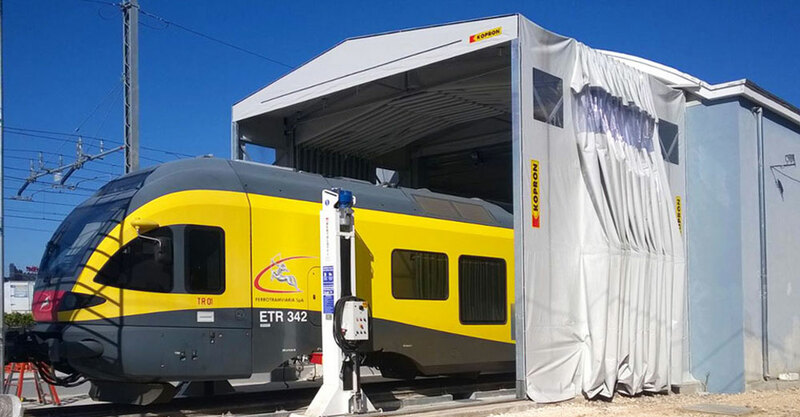 Thanks to this motorized front retractable temporary warehouse, which slides at a speed of 1 m/s, the company can meet two important requirements: to have a covered area for the wagons when closed, to have room to operate on the overhead lines when open. The warehouse covers and uncovers the working area at need, thanks to the innovative folding system which is carried out on special anti-derailment, anti-accident, dirt repellent wheels sliding on tracks - all Kopron patented. The size of the warehouse is considerable: 8,5 mt wide x 25 mt long x 6,5 mt tall with vision panels on the sides plus afast opening door 8 mt x 5.5 mt tall, which slides along with the warehouse. The whole structure once packed occupies only 1/3 of the total length, about 8,5 mt, leaving much free space. a line of transparent vision panels size 1x1 mt, on the long sides of the structure for light filtering, motorization with dead man’s switch, a fast opening door mod. KV-FP installed on the front part, which slides along with the whole warehouse. La structure is installed at a distance of only 2,5 mt from the mains track of the trains. Fersalento operates in the railway sector ever since 1960. It was founded by Mr Germano Ventura who started off as an individual company, and became a limited liability company in 1983 taking care of construction and maintenance of trains. With this temporary warehouse he can continue his job under better conditions. We wish to thank in particularly: Mr Aloisio of Ferrotranviara and Messrs Gonnella and Palmieri of Fersalento and for having chosen Kopron for this great work.